When you think about it, the ocean depths are an even more terrifying environment than the void of space. In the far reaches of the cosmos one can at least see the stars; underwater, there’s only pitch-black darkness waiting to crush you to pulp. It’s a great setting for putting a group of people under intense mental and physical pressure, one that director Kevin Macdonald (The Last King of Scotland) and screenwriter Dennis Kelly put to excellent use in Black Sea, a thriller slightly less preposterous and more entertaining than most. 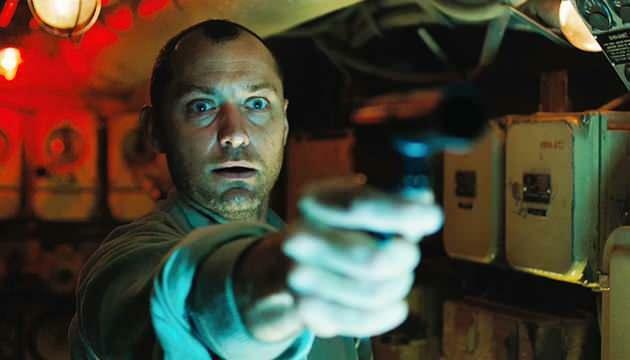 Jude Law continues his current deglamorized career arc (see Dom Hemingway if you haven’t already) by starring as Robinson, an embittered submarine captain who’s pink-slipped by the marine salvage company he’s been a devoted employee of for more than a decade. Estranged from his family and with nothing to fall back on, he pounces on an opportunity to change his fortunes: an off-the-books job offer to lead a mission to recover a huge cache of gold bullion from inside a Nazi U-boat that sank to the bottom of the Black Sea during World War II. Robinson and his partner Blackie (Konstantin Khabensky) assemble a half-British, half-Russian crew of assorted washouts and screw-ups that includes hot-headed Fraser (Ben Mendelsohn), teenage father-to-be Tobin (Bobby Schofield), emphysema-plagued sea-dog Reynolds (Michael Smiley), inscrutable Morozov (Grigoriy Dobrygin), and skittish company man Daniels (Scoot McNairy), and they slip into politically dicey Crimean waters under the nose of the Russian fleet, in a Soviet-era death-trap of submarine that should have been scrapped decades ago. Naturally, you can’t have that many headcases in that cramped a space under conditions that stressful for too long before things will start to go off the rails, which they do quickly, repeatedly, and quite fatally. Still, Black Sea‘s biggest strength lies in Macdonald, whose work is primarily split between incredibly tense documentaries (One Day in September and Into the Void) and a broad array of ambitious dramas (State of Play and The Eagle). While he’s been consistent on the former, his fictional work is mixed; with Black Sea, he’s seemed to found his, well, sea legs as a director, and digs deep into the pulpy material, turning a throwaway action-drama into a meaty B-grade thriller. His documentarian side lends a degree of verisimilitude to the familiar submarine-action beats of crash dives, collisions, crush-depths, equipment failure, and clashing personalities. More importantly, he and Kelly (a TV and theater writer making his feature-film debut) always keep their eyes on the human factor, reminding us that these are down-and-out working stiffs willing to go to such deadly extremes not just to survive, maintain their blue-collar sense of dignity. They are working-class men caught in the personal hell of being unemployed, a state embodied in Robinson and the way Law fuels his character’s obsession; as the clock ticks and the pressure mounts, it becomes increasingly clear that he doesn’t want the gold — he’d rather salvage his dignity and self-respect. What he doesn’t seem to realize is that it might be a one-way trip.